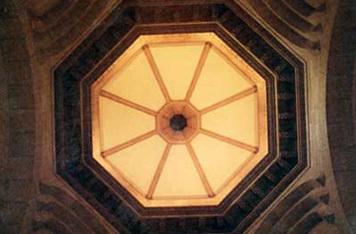 The media naranja cupola or half-orange dome is a dominant feature of the Manila Cathedral. 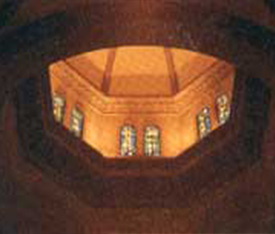 Eight pairs of stained glass windows by artist Galo Ocampo, found at the base of the octagonal drum, give the church interior a dramatic lighting effect. It was a Florentine architect and engineer, Fray Juan de Uguccioni, who first introduced the dome and transept in 1750, a design which completely changed the Manila Cathedral, giving it a strong architectural character in the entire city.